Fastball Zenyatta joins the 2018 Overwatch Summer Games with new legendary skin – AiPT! Another day, another legendary skin coming to Overwatch. Fastball Zenyatta is the newest legendary skin coming to Overwatch, debuting at the Summer Games on August 9. The announcement came via the official Overwatch Twitter account. Zenyatta is now the sixth hero to receive a legendary skin in celebration of the Overwatch 2018 Summer Games. Yesterday fans got a look at Lacrosse Roadhog, but as Zen is one of my mains, I’m far more excited for today’s announcement. 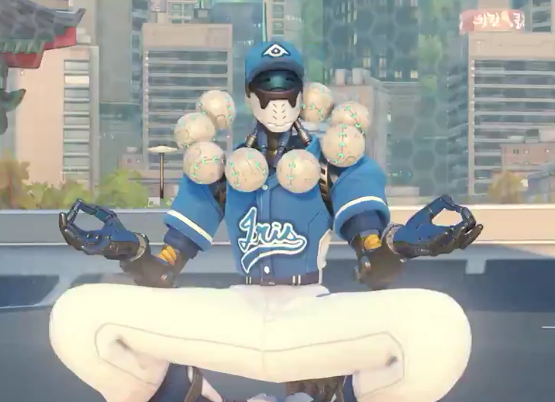 Don’t get me wrong, Lacrosse Roadhog was cool, but Zenyatta throwing baseballs around is far more natural. It fits the character perfectly. Fastball Zenyatta sports a necklace of baseballs floating around his neck, replacing his signature orbs. His robes have been replaced with a traditional baseball jersey. Zen is playing for “Iris” the team name printed on his jersey and he’s wearing number 94. You have to wonder why Blizzard chose 94 though. It’s a mystery I hope to be solved. We can expect new legendary skins to be available for purchase at 3,000 Overwatch credits, or through a Summer Games loot box. We’ll more than likely see at least one more loot related announcement from Blizzard before the Summer Games begin tomorrow August 9. In addition to the new legendary skins, players will also be able to enjoy the return of Lucioball. Think catcher Winston will be able to handle Zen’s fastball?